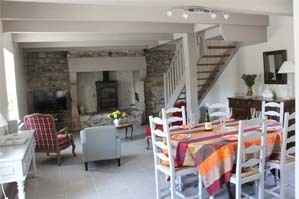 This holiday cottage is classified 4 ears by " Les Gites de France, Relay of Finistère ", and is equipped with free WiFii internet. To Bénodet, in south Brittany, sea resort 5 stars of south Finistère. 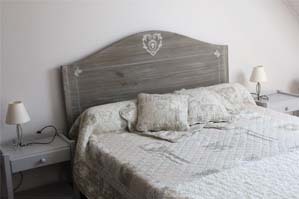 This gite 12274 can welcome 6 persons. 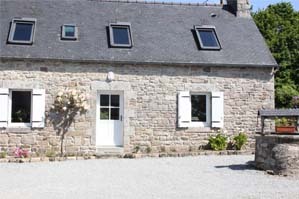 The holiday rental is a nice cottage with private garden, country-à-vis modern, spacious, functional, bright, very comfortable, very well equipped and quiet. Our cottages are close to the beaches, in Quimper, Quimper, Concarneau, Pont-Aven, Forest Fouesnant, Port-La-Foret, Guilvinec, La Pointe du Raz, the islands Glénan Locronan. - Very many summer events, cultural and folklore, many of which are free. The cottage is located in Brittany, Finistere south in Benodet, and have the address: Kerholven, 75 road Guerveur, 29950 Benodet. 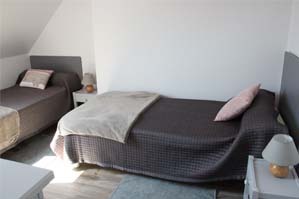 These vacation rental is located between the cities of Benodet (4 km) and Fouesnant (4 km). 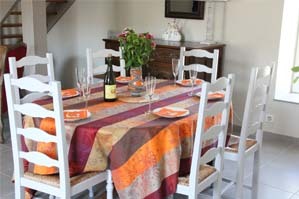 It is a stone house of 130 sqm, which has been completely renovated cottage, classified 4 ears for 6 persons with "Les Gites de France", completely independent, with 3 bedrooms, with its garden, very comfortable, quiet. 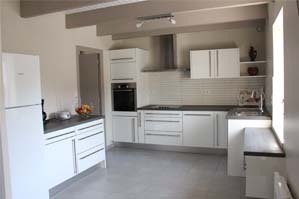 - Upstairs, a bedroom with a double bed 160x200, two bedrooms with two beds 90X200, a bathroom with WC. This vacation rental is individually, equipped with cutlery, kitchen utensils, free wireless internet, television, cd-dvd, hob, oven, microwave, kettle, coffee maker, refrigerator, dishwasher, washing machine, dryer, one bed and one chair for baby. 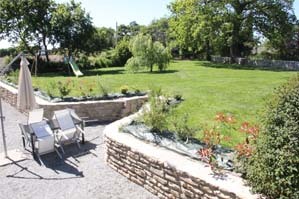 The private garden of about 800 m² cottage has a garden, a barbecue and a swing. The parking of vehicles is in the courtyard in front of the main entrance door. 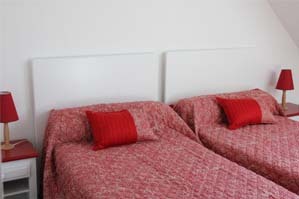 It is possible to rent sheets (9 euros per bed) and towels (5 euros per person) for the holidays, and control the household end of lease (40 euros). - Or by mail: Alice SALAÜN, Kerholven, 75 route de Guerveur, 29950 Benodet, France. - Coming from Lorient by RN165, take exit N° 51, at Coat-Conq, towards La Forêt Fouesnant, Fouesnant, Benodet. Cross La Foret Fouesnant, Fouesnant, then take direction Benodet. At the end of the town of Fouesnant, from the Police "Gendarmerie" drive for 2.1 km. Turn right 50 meters after the yellow pannonceau " Antique and Bracante", road Kermine. And ride for 1.2 kilometers. The cottage is on the left at No. 75. - Coming from Brest by the RN165, exit Troyalarch take the direction of Saint-Evarzec. Cross Saint-Evarzec, then Pleuven then Clohars-Fouesnant. Since the release of Clohars-Fouesnant, drive for 1.5 miles and turn left road Guerveur. The cottage is 300 meters on the right at number 75.